Toshie M. (Henley) Mancuso – of Woburn, died peacefully at her home, April 2nd, with her family by her side, after a hard-fought battle with cancer. The beloved wife of 41 years to John P. Mancuso, she was sixty-six years of age. Born in Argentia, Newfoundland, Canada, Toshie was the daughter of the late Melvin “Ray” and Mary (Lucier) Henley. Growing up, her father served in the US Navy and was stationed in various places around the world, until settling in Brighton, MA. She was a graduate of St. Columbkille High School in Brighton and then attended Boston Business School. While visiting White Horse Beach in Plymouth, Toshie met her future husband and best friend, John. They married in 1977, first moving to Medford, then later to Woburn, where they raised and built their family. For many years, Toshie worked for Simmons College in the Financial Aid Department. After taking years off to raise her family, she began working again as a bank teller for Citizens Bank in Woburn, at Four Corners. Toshie’s main focus and greatest joy in life was her family. She dedicated and devoted her life to them and enjoyed nothing more than spending time with them. 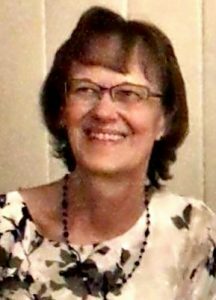 When her children were young, she was very involved in their schools, volunteering her time in the school libraries, both at the Reeves and later the Joyce Middle School, and writing the parents newsletter. She enjoyed hosting parties at her home and was a fabulous cook! Vacations with her family to their home in Madison, NH brought her joy and made lasting memories. In more recent years, she and her husband were blessed to have traveled to many beautiful places in the United States, Canada, Mexico and Europe. In her spare time, she enjoyed reading and exchanging books with her many friends, gardening, playing cards, and solving and making puzzles. She had a deep and devout faith and was a longtime communicant of St. Barbara’s Church in Woburn. Her grandchildren were the lights of her life and making memories with them, and laughing over silly jokes, always made for a fun day. Along with her husband John, Toshie is survived and will be deeply missed by her children, John Paul Mancuso, his wife Caitlin of Melrose, Michael Mancuso, his wife Corrie of Tewksbury and Katie Mancuso of Woburn. Dear sister of Walter Henley, his wife Lucy of Natick, Ray Henley, his wife Cynthia of Miami, FL, Ellen Breslin of Hawaii and Margarett Cady, her husband Barry of Melrose and sister-in-law of Lea Terfry of Wakefield. Treasured “Grammy” of Aiden, Jaxon and Colbie. Also survived by many loving aunts, nieces, nephews, cousins and friends. I am so sorry to hear of your mom/wife’s passing. I will always remember our time together as Joyce PTO bosses. She is a love! I’m so sorry for your loss. I really loved Toshie and enjoyed working with her at the bank in the past. May you hold on to the wonderful memories of her. Praying for you during this difficult time. Dear John and family, I’m deeply saddened by the news of the death of Toshie. I remember how involved she was when her son Michael and my son Serge IIe were playing in the basketball team at AC, in Arlington, MA. We used to travel together to attend the games. Mrs. Mancuso was such a sweet and polite person, she will be missed. Hoping that the memories of her, will give you and your children strength at this time. May you all find peace in the coming days.